The Psychology of Judgment and Decision Making - A Book Synopsis - Eric D. Brown, D.Sc. One of the books that I use in my various consulting projects and academic work is titled “The Psychology of Judgment and Decision Making” by Scott Plous. This particular book might seem like a very academic book, but in reality it is very accessible and easy for anyone to read and understand. I’ve had this particular write-up in my ‘draft’ folder for quite some time and is a by-product of a quick write-up that I created for a client a few years ago. This isn’t a full review of the book but more of a synopsis of the main topics found within the book. If you have an interested in decision support, judgement, perception, bias or heuristics I’d recommend you pick up a copy for yourself. This book provides an introduction to the judgment and decision making theories that have been developed over the years. The book does a good job of introducing topics like decision making, memory, context, perception, heuristics and bias. This book is perfect for non-psychologists to use as an introductory text on the subject and can act as reference material anyone designing research projects. The book is broken down into Six Sections with each section introducing new concepts and providing case studies to help solidify the concepts in the reader’s mind. These sections are listed below and described in more detail throughout the remainder of this paper. The first section covers a considerable amount of material throughout its 32 pages. Topics covered in this section include hindsight, perception, context and memory with examples provided to try to illustrate the various topics. I found this section to be slightly over-arching in its topics and after completing the section, the topics weren’t as clear to me as I would have liked. I felt as if the author was trying to cover too much material in too little space. The introduction and description of the halo effect was the one topic that was the most interesting from this section. The Halo effect, which is an example of context dependence, is a topic that many people in research and industry should be aware of because it shows that the way people to stimuli is dependant on the context that the stimulus is received (Plous, 1993). This topic, which was covered extensively in the book The Halo Effect by Philip Rosenzweig, is an interesting concept and one that many people fall victim too. Rosenzweig’s book is not an academic foray into the world of psychology but does provide some excellent examples of how cognitive bias and context dependence can cloud the judgment of many intelligent people (Rosenzweig, 2007). This section covers some very interesting topics from the order of questions, wording of questions and the framing of questions and how they might influence the results obtained from those questions. These topics are extremely important to researchers since the way questions are worded and/or asked can influence the results of the research. The concepts described in this section are arguably some of the most important issues for any researcher to understand as they will need to be taken into consideration when designing survey questions to be used in research. This section covers the various models that have been developed to described the decision making process. Models such as Expected Utility Theory and Prospect Theory are described and examples are given to help the reader understand the models. Chapter 9: Descriptive Models and Decision Making is one of the more interesting chapters in this book. This chapter provides an introduction and explanation of the Prospect Theory of decision making. Prospect theory is a more descriptive model than the expected utility theory and provides methods to model real world scenarios rather than the optimal solutions that are modeled with the expected utility theory. This theory differs greatly from expected utility theory by predicting that a person’s “preference will depend on how a problem is framed” (Plous, 1993). Section four covers two basic, but important, topics: (1) the processes that people use to make decisions and; (2) the biases that result from these processes. The process by which people use to make decisions is said to contain the use of rules of thumb, otherwise known as heuristics. Heuristics are believed to yield fairly good estimates but can lead to bias in the decision making process. This section attempts to cover the well known heuristics and biases. Some examples of these are: representativeness heuristic, availability heuristic, probability and risk, anchoring, perception of randomness, and attribution theory. This section covers a lot of material with a considerable number of examples. I didn’t feel as though the section was well-connected and seemed to try to cover more material than needed. This section covers the social factors that affect judgment and decision making. The theme of this section can be summed up fairly easily with the following sentence: people are social animals and their judgment and decision making processes are affected by social influence. Chapter 17 provides an interesting overview of how society affects an individual’s decision making process and judgment with such topics as social facilitation, social loafing, diffusion of responsibility, conformity and groupthink. Chapter 18 takes a look at the issue from the group’s perspective and compares the decision making performance of a group to the performance by individuals. The section on groupthink (Chapter 17, page 203) is one of the most interesting parts of this section. Groupthink is a problem in many organizations and is difficult to combat and prevent but this section provides some interesting warning signs and measures to fight groupthink. This last section of the book provides an overview of traps that people and organizations commonly fall into. The author lists three major traps: (1) Overconfidence; (2) Self-Fulfilling Prophecies and; (3) Behavioral Traps. Each of these traps is given their own chapter and each is described fairly well with examples used to clarify where needed. The author tries to describe these traps and attempts to provide methods to avoid these traps, but most of these avoidance methods seem to be a little to simplistic. Unlike other books on the topic, this book does not provide (nor purport to provide) a ‘how to’ for decision making and/or judgment processes, which I think this is a great thing. 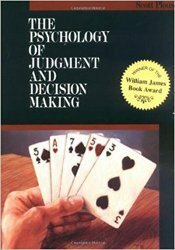 This book provides background information at a high level for non-psychology majors to use to better understand the decision making and judgment process. Section Two: How Questions Affect Answers is one of the most informative sections in this book. If a reader read only this section of the book, they would be in a much better position to understand how surveys are conducted and why some surveys are conducted in the manner in which they are. This book is a short, well-written overview on most topics and should be required reading for all researchers and students. Plous, S. (1993). The psychology of judgment and decision making. Philadelphia: Temple University Press. Rosenzweig, P. M. (2007). The halo effect– and the eight other business delusions that deceive managers. New York: Free Press. Schuman, H., & Presser, S. (1981). Questions and answers in attitude surveys experiments on question form, wording, and context. New York: Academic Press.